MEDEX Northwest has taken a competency-based approach to curriculum design since it opened in 1969. The two primary components of the curriculum are the classroom (known as didactic) phase and the clinical phase. Each section spans approximately one year, including an additional quarter of material preparing them for advanced clinical and leadership roles, for a total of 27 months and 162 credits. The didactic year begins with basic science review, reinforcing concepts about the fundamental building blocks that underlie the practice of medicine. The curriculum throughout the year integrates material across courses using an organ system approach. For example, the respiratory physical exam and specific history-taking techniques are taught during the same week as the respiratory pathophysiology content. Later in the year, the content for the Adult Medicine, Patient Management (pharmacology) and Emergency Medicine coursework is similarly integrated. Each course is chaired by a MEDEX faculty member who provides leadership and direction for the course, manages the testing process, and presides over course development across time. Individual course coordinators at each MEDEX site manage the course delivery locally and participate in ongoing course development and evaluation. The centerpiece of the clinical phase of training is the four-month primary care preceptorship. This is most often completed in a family practice setting, or students may work with general internal medicine physicians and PAs. There are also six shorter one-month rotations, called clerkships, which are intended to expose future primary care clinicians to specialty practice. The required clerkships are behavioral medicine, emergency medicine, general surgery, inpatient and a rotation in a medically underserved setting. An elective rotation rounds out the year. Students are expected to obtain experiences in maternal health and pediatrics during the longer preceptorship. 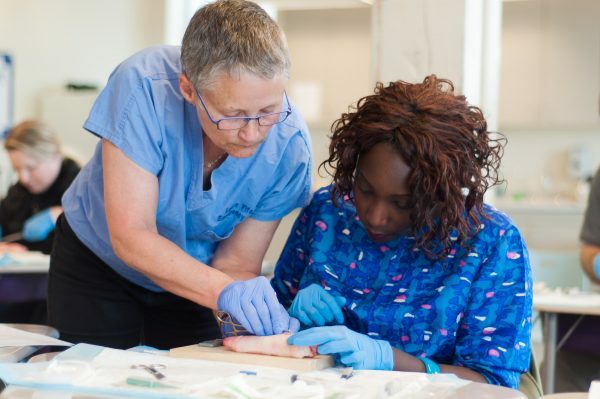 Rotations are arranged throughout the five-state WWAMI service region, and all students are expected to travel to participate in the community-based training opportunities in the area. Students must return to the program four times during the year for orientation, additional instruction, evaluation and graduation. The core MEDEX mission of primary care and access for rural and medically underserved populations is a recurring theme across the curriculum.